Over the past three years, 17 high school football players have died after sustaining head injuries while playing. A similar situation in the NFL would have caused a national uproar, so how has this been allowed to happen to our youth? Take a look at trailer for this riveting episode of HBO’s series Real Sports with Bryant Gumbel, which is airing several times on HBO through mid-December 2016, as well as On Demand. The episode as a whole explores why there are such inconsistencies in protecting professional athletes versus the youngest players. Regardless of age and profession, motor vehicle accidents and falls are the most common ways that people can sustain traumatic brain injuries. Even first responders – police, fire, and ambulance crews – regularly go into harm’s way and risk personal injury that includes concussions, as recently happened when two firefighters in New Jersey slipped while jumping off their fire engine at a house fire. Although sports like football, soccer, and lacrosse get a majority of the press about head traumas and traumatic brain injuries, most of the traumatic brain injuries that we see in HeadFirst Concussion clinics are due to everyday events such as slips and falls and motor vehicle accidents. Some doctors tell me that the “concussion craze” is going to burn out soon. However, I think the way concussion specialists and medical providers diagnosis and treat traumatic brain injuries will continue to evolve. Other clinicians believe that education, evaluation and treatment of mTBIs will continue to grow in different directions. What we have found in HeadFirst Concussion clinics is that 60-70% of mTBIs are not sports related and more than 95% of our injured patients have not had baseline neurocognitive testing. While concussions continue to make the news and diagnosis increase as public awareness spreads, we encourage people of all ages to schedule a baseline neurocognitive test. CTE’s connection to football has been in the news for five years now, with a debate centered around whether the number of concussions will affect long-term health and well-being of those playing the sport. Likewise, I’m constantly asked by patients and parents what the future effect of this or future concussions will be on their health. A recent study released by researchers at the Boston University School of Medicine (such as Dr. Robert Cantu, Dr. Ann McKee, Chris Nowinski and others) will probably give moms and dads across America a moment of pause before starting a collision sport like football or hockey. An answer may lie in a concept developed by these researchers called the Cumulative Head Impact Index (CHII). They found individuals who had more hits to their heads—regardless of whether they had a concussion or not, were significantly (i.e., not even close…a large statistic margin) more likely to experience later-life cognitive problems, apathy and depression. The caution here is that the sample size was only 93 individuals and the exposure was only to football. The next step is for medical providers and concussion specialists to help families begin to connect the dots throughout the developmental hurdles of a child’s life. For example, the health outcomes for two 7th grade beginning hockey players if they have a different history. One student may have fallen off a changing table as an infant and suffered a skull fracture, have been in a motor vehicle accident, and have fallen multiple times during winter sports, while the other 7th grader may not have suffered any head injuries or significant head trauma. Baseline neurocognitive testing like the ImPACT® test might look different on these two young students, and the outcome and recovery time of any current injuries sustained by each of them could be considerably different. I’ve often said that kids can’t live in a bubble as much as parents are sometimes inclined to want to wrap their kids in bubble wrap. Young people—really, people of all ages—are going to be in car accidents, bike accidents, and slip and fall just going through life. Parents need to make their own unique, informed decision about how much additional risk of physical injury to which they want to expose their child, given his or her medical history and athletic abilities. The much-anticipated movie “Concussion” is scheduled for release this year on Christmas Day, and already there is Oscar Award talk for Will Smith, who plays the role of Dr. Bennet Omalu. It was Dr. Omalu who discovered the tragic progressive degenerative effects of years of multiple concussions in NFL players, which he named CTE (chronic traumatic encephalopathy). For their part, the NFL hasn’t had much reaction to the movie, preferring to keep the controversy at arm’s length. While Dr. Omalu has vocalized his opposition to children playing football until they are legally and emotionally old enough to understand the danger of putting their brains at risk, the NFL can’t afford to lose any of their reported $7+ billion in annual revenue. Yet, while the debate rages on, two points are patently clear from years of scientific research: that children repeatedly hitting their heads during developmental years is potentially very harmful, and that college and professional football players can face significant health consequences from playing the sport. But just how serious are families going to be about keeping their children from playing football? Indeed, this is just the beginning of the conversation about brain injuries. As a community-based concussion clinic that has treated more than 30,000 traumatic brain injury patients over the past three years, HeadFirst Concussion Care has seen multiple reasons for why people sustain concussions. And while football is a violent sport, soccer, lacrosse and hockey also put our youth at risk for head trauma. And again, this is just half of the dialogue. HeadFirst’s data shows that traumatic brain injuries sustained while playing organized sports with a concussion protocol in place (high school or college sports) account for a relatively small percentage of our patients. In fact, in as many as 80 percent of our patients, concussions are sustained by other mechanisms of injury. These include non-organized sports-related injuries (bike riding, skateboarding, trampolining, skiing, pick-up or other informal recreational games), slips and falls, motor vehicle accidents, and assaults. The key message is that the people must understand that traumatic brain injuries can happen to anyone, anywhere, at any time. Not just kids. Not just athletes. And certainly, not just NFL players. And since anyone is at risk, everyone must understand the proper protocols for healing an injured brain. On a final note to end the year, my holiday wish is that families, schools, and employers begin to talk about head injuries and follow traumatic brain injury protocols to keep all children and adults safe. What Can We Learn From Dale Earnhardt Jr’s Experience With Concussions? Dale Earnhardt returned to his race car last weekend after spending several weeks recovering from two traumatic brain injuries. He has been very open about his experiences with them and because of that we can take away several key points…..
1. Every Concussion is Different! 2. Healing from a concussion is hard! “I was just really frustrated and having a lot of anxiety of, ‘Man, how long is this going to last? Is this ever going to be right again? I had no answers,” he said. “These guys are professionals, and I asked everything I wanted to know, and we went through all these drills and exercises, and they ran me ragged, and it was a fun day. 3. Professionals help with the healing! “I felt I understood what I was dealing with and the process was and felt a lot better. If I ever got any doubts, I’d call Micky up and we’d talk about it for an hour, and that was the best therapy was understanding what was going on. The regular symptoms of being foggy and having headaches, those were prevalent in first concussion, not so much in (the second) one. 4. Concussions need to be taken seriously! “It changed the way I feel about it to where if I know I’ve suffered another concussion or if I have symptoms after an accident, I’m definitely going to be a lot more responsible about it,” Earnhardt said before practicing his No. 88 Chevrolet at Martinsville Speedway. “I can understand peoples’ opinions that they would try to push through it or they would ignore it to stay in the car because I did the same thing. “Some concussions are really bad, and I don’t care how tough you think you are. When your mind’s not working the way it’s supposed to, it scares the (crap) out of you. You’re not going to think about race cars, about trophies, about your job. You’re going to think about what I have to do to get my brain working the way it was before. That’s going to jump right to the top of the priority list. I definitely take it more seriously now after everything I’ve learned. We find it interesting people still call concussions “mild brain injuries.” Furthermore, culture makes every attempt to break down the preconceived notion that concussions are nothing serious. 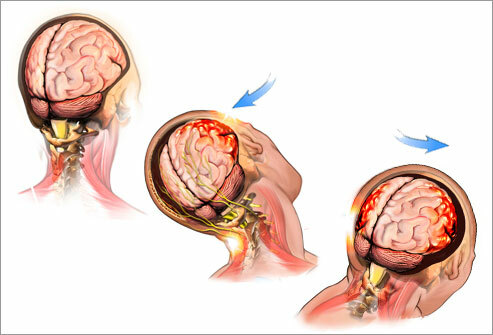 1) Did you know that the word concussion comes from the Latin word concutere which means TO SHAKE VIOLENTLY. cognitive and emotional impairments. Think that’s mild? These side effects can range from blurred vision and headaches to convulsion and amnesia. In severe cases, psychiatric disorders and even long-term memory loss (including a greater risk of developing Alzheimer’s) are possible. Hardly mild. Don’t get us wrong, in nearly all cases, people who sustain a concussion will live a happy, healthy and fully functional life. We just need to make sure our facts are straight, especially from the resources we use to learn. Concussions are a brain injury, not a “mild injury,” not a “mild head trauma”… A brain injury. For reasons that have long mystified many medical professionals, coaches and parents, girls’ lacrosse has never used helmets like boys’ teams. Even with the growing popularity of the sport, soft helmets are currently the only option females have to protect themselves against injuries, and not every team even uses them. However, even soft helmets may not protect against concussions. Brain injuries, being different from head injuries, occur when the brain shifts inside the skull—something soft helmets may not prevent. In fact, with a hard enough impact, even hard helmets don’t always protect against concussions. WBAL-TV 11 (NBC affiliate in Baltimore, Md.) recently reported on both sides of the discussion, featuring Kevin E. Crutchfield, M.D., a neurologist with Sinai Neurology Associates, who says he believes female players should all be wearing hard helmets. On the other side of the debate, U.S. Lacrosse, the governing body of men’s and women’s lacrosse, is concerned that if hard helmets are introduced to females playing the sport, the game may be played more aggressively. Local coaches of girls’ lacrosse teams who are using the soft helmets, though, say they have seen a decrease in the number of concussions sustained by their players and plan to continue their use .